This could be the last post on the Daigle or Dague family. It was a draft post I had written before I found Stephen Dague’s real name in this document also taken in the same parish registers. I don’t have the exact image to show you of the baptism of Étienne Daigle in 1789 who was the father of who I think is Stephen Dague who died in 1923. However we have definite proof of Étienne Daigle Senior’s birthdate: 23 September 1786, on page 25. 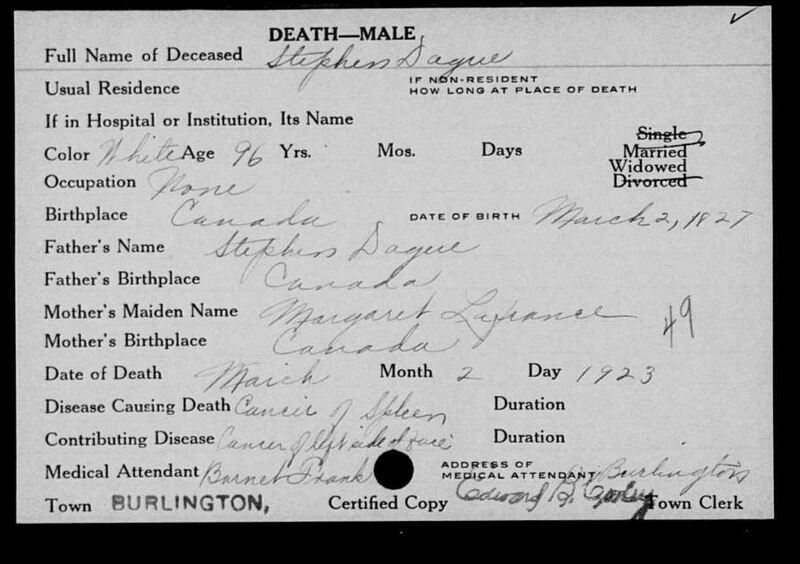 But is he “THE” Stephen Dague who had married Margaret LaFrance from Moscow, Quebec? This message was left on a forum in 2001, and is probably where Judi got her information about Moscow. Margaret/Marguerite LaFrance. They may be from the Moscow, Quebec area. Had son Stephen/Etienne Dague, b. 2 March 1827. Family migrated to Vermont in the 1830s. End of the draft post. The search is all but over and I have tried to reach Gloria Reynolds by sending her an e-mail using the e-mail address she left on the forum. I hope she is still interested. It has been thirteen long years. Who ever said Start small, start slow? I am closing this chapter in the life of Stephen Daigue who left this earth on March 2nd, 1923. No pictures to show you, just a name on a death certificate. That’s always the saddest part in a search for someone’s ancestor. 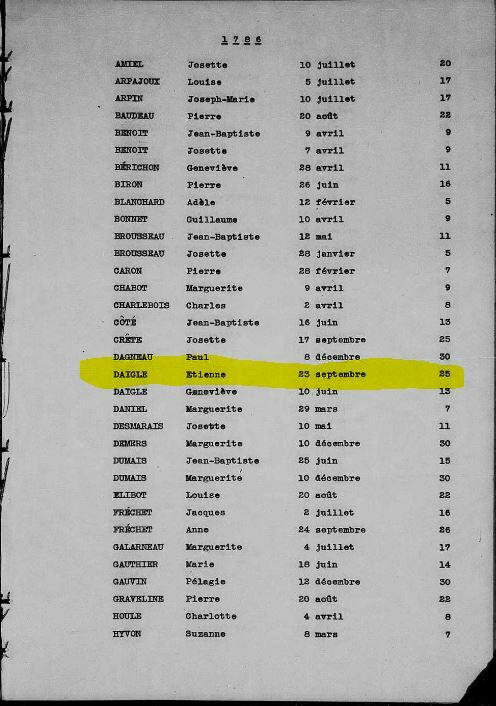 What is above is part of my search that led me to this as I was just trying to find more clues in the Notre-Dame-du-Rosaire parish registers. Le vingt huit mars mil huit cent trente nous prêtre soussigné avons baptisé Étienne né ce jour du légitime mariage de Étienne Daigle journalier du lieu et de Marguerite Messier. Le parrain a été Pierre Daigle, la marraine Charlotte Fontaine qui le père absent n’ont su signer. How can you trust someone who said Start small, start slow? It was worth all the efforts. Maybe someday someone will write me and have old pictures of people he or she does not have a faintess idea who they were. How can you trust someone who said Start small, start slow with what he found about one of your ancestors? I know Judi will come back for more down the road.